Peter ‘Scottie’ Scott was the name and poker was the game. Hog poker that is - with snarling exhausts and anxious faces looking towards a leadening sky. 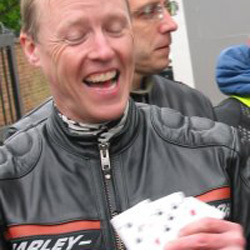 There were 22 bikes at Warr’s in Chelsea as Nick Page explained how cards would be distributed at each stop point on our trip down to the Cinque Port ancient town of Rye and back up to Warr’s in Mottingham. Smiling Steve Beauchamp timed his arrival to perfection - any tighter and he’d have missed the whole event. How many assistant directors does it take to cause confusion? Two. We approach a right hand junction being clearly marked by Rick and his big fat rear tyre. As we wait for the lights to change Nick says to me “He’s in the wrong lane!” Nicks pipes are so damn loud I hear “They are going the wrong way!” I scoot up front and tell people not to turn right and start leading them straight. Nick was talking about Irish Tom on his Sportster who had decided to go home and not chance the weather! So Nick hauls after us and turns us around back to the right junction. But by the time we get there we are on our own. The whole of the main ride is long gone. But eventually the magnificent seven made the first rendevous, cards were distributed, coffee drunk and all 21 remaining bikes back on the road. It was a terrific sight, the long line of rumbling shiny porkers. So magnificent was it that on the outskirts of Rye, a bloke in a Peugot came hauling over the hill in the opposite direction - “Oh look at all the lovely bikes!” No mate! Look at the road in front of you where there is a car waiting to turn right after we have all passed by. You will hit her in three two, too late - you’ve mashed it. No injuries thanks be to goodness but a few sphincter tightening moments for one or two of the clan as the guy was locking up. “Please don’t swerve my way!” That will have spoiled his Sunday. Without further incident we got to Rye, fuelled bikes and people, got a little shopping in and headed back towards Mottingham. Up the 268 and then on to the A21. The rain stung down and it got a little less than pleasant but we all made it safely to Warr’s to be greeted by John Warr himself. Nick did the final distribution and the flop. The winner - Dave Mollison. His white Sportster was one of our magnificent seven who blundered through the first part of the trip. The winning poker hand? Four sevens! ...Naturally. 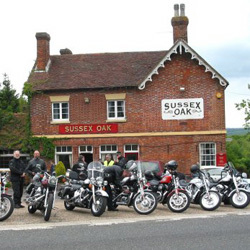 Welcome to Dave Mann, Andrew Papas, Peter James, Richard Szwagrzak who were all on their first Chelsea & Fulham rideout - hope you enjoyed yourselves and we see you back soon.